At first glance, the Section 3AA playoff race appears anything but. It's more like the children's tale of the "Tortoise and the Hare." Top-seeded Eagan is the hare, the speedy and confident favorite to return to the state tournament. The rest of the field is the tortoise, primed to take advantage of the favorite's stumbles and overconfidence. Coach Mike Taylor will make certain his Wildcats (21-3-1) aren't an overconfident bunch. He's helped by his team's closing 1-1-1 stretch (losing to Burnsville and tying Bloomington Jefferson), an reminder that Eagan can't overlook any team, no matter how many superstars the Wildcats can throw on the ice. 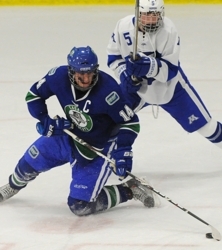 It starts on the forward lines for Eagan, which boasts of two Mr. Hockey finalists in Michael Zajac (21-26-47) and Will Merchant (23-22-45), both of whom have committed to D1 programs. Zajac is a strong power forward with terrific puck skills in tight quarters, while Merchant has speed and shiftiness to go with a rocket shot. They're joined by a host of players with No. 1 potential in Nick Kuchera (15-32-47), Zach Glienke (20-14-34) and Cullen Willox (14-16-30). Goaltending duties have been split by senior Christian Butler (12-3-1, 1.94, .900) and freshman Andrew Lindgren (9-0-0, 1.42, .897). 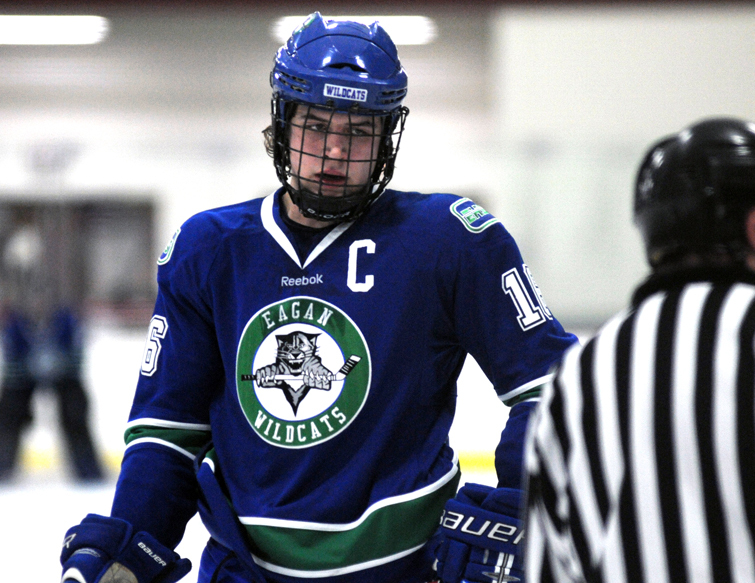 Wildcats' defensemen Sam Wolfe (2-25-27) and Eli May (11-16-27) also have a D1 commitment in hand, making Eagan the only team in the state with as many as four top college commits. Throw in Derick Kuchera (6-12-18) and Connor McGovern (4-17-21) on the blue line and Eagan is deep, talented and experienced. Without overconfidence, that leaves only a possible stumble that could knock Eagan from its perch. And there are several teams capable of doing just that, although it would be a huge upset. Eagan is the only team in the section to score more than 3.4 goals per game and the majority are under 3.0, so it's likely we'll see plenty of low-scoring games throughout the playoffs. That makes every goal that much more important -- as well as stopping them. No. 2 Apple Valley (11-11-3) isn't going to ask what could have been, no matter that it lost three key players to early departures. No, Jerry Hayes' club is focused more on what remainded. And after a slow start as the Eagles got comfortable with their new roles, they've climbed into the second seed behind Eagan. Tate Erickson (9-15-24) and Sean Lang (9-15-24) lead the team in scoring, as the Eagles average just 2.8 goals per game and have no player with double-digit goals. The Eagles lost three of their last five games, but played close with highly-ranked Burnsville, Lakeville South and Eden Prairie. They've had less luck against Eagan, though, losing twice by a combined 14-2 score. Things are tight in the middle of the pack. No. 3 Cretin-Derham Hall (11-11-3) can put the puck in the net, led by Luke Dietsch (20-15-35), Jack Stang (10-17-27) and Patrick Cullen (14-8-22). Dominic Nitti (4-23-27) anchors the blue line for the Raiders, who finished tied with No. 6 Hastings (12-11-2) for fourth place in the Suburban East Conference standings. The Raiders from Hastings were paced by Nate Flynn (25-18-43), the section's leading goal scorers. No. 4 Eastview (10-13-2) also has a top goal-scorer in explosive Scott Nelson 923-20-43), while No. 5 Park of Cottage Grove (12-9-4) had its best season in several years behind stalwart goaltender Erick Majerle (11-9-4, 2.61, .918). No. 7 East Ridge (7-16-2) also has a veteran goaltender anchoring the club, Andrew McDonough (6-14-2, 2.63, .896). Both could easily steal a game or two in the playoffs. No. 8 Woodbury (7-14-4) and No. 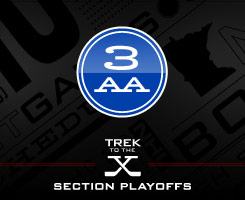 9 Rosemount (5-20-0) duel in the first round for a chance to face top-seeded Eagan in the quarterfinals. It's not as daunting a task as it may seem, though, as Woodbury actually led Eagan in the final of the South St. Paul Premier Tournament back in December before falling 3-2. 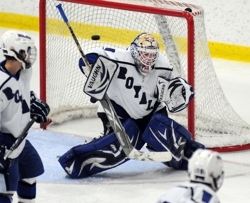 Woodbury goaltender Josh Erickson (7-13-4, 2.76, .918) makes the Royals very dangerous. With a talented senior class that includes two Mr. Hockey finalists (Michael Zajac and Will Merchant), two DI defensemen (Sam Wolfe and Eli May) and so many other highly-regarded players it would be impossible to name them all in this space, top-seeded Eagan is a prohibitive favorite to get to state out of Section 3AA. In fact, the Wildcats may be the most heavily favored team in the state -- which says as much to their talent as the struggles of the rest of the section this winter. Most observers feel that Eagan is the most prohibitive of favorites to get to state, as the Wildcats are the only ranked team in Section 3AA. But Woodbury showed rankings don't mean everything in a 3-2 loss to Eagan in the championship game of the South St. Paul Premier Tournament. The Royals and goaltender Josh Erickson gave heavily-favored Eagan all it could handle -- and will likely match up against the Wildcats in the quarterfinals.